Writing relevant content is not enough. Have you looked at the Internet lately? It’s awash in content, most of it mediocre at best. Many companies have jumped on the content marketing bandwagon, but very few understand how to get results with it. Many digital agencies are, unfortunately, similar. Company X tells them they are a real estate agent, so Digital Agency Y writes weekly posts about generic topics like “5 Things New Homeowners Need to Know”. This doesn’t work. Do you know why? Because every other real estate agent has the exact same blog post. All with fairly useless content. This doesn’t help with SEO or in building customer trust. So how do you strategically write content that does have an impact on your bottom-line? It all starts with research. What are the questions your customers are actually asking? This is a typical intro screen and shows us some great information. Of course, nice to see that we’ve had a 45% increase in traffic since we started working with this particular therapy center :). We can also see who our main competitors are in this space for our Seattle area. As we can see, we’re now blowing the competition out of the water. 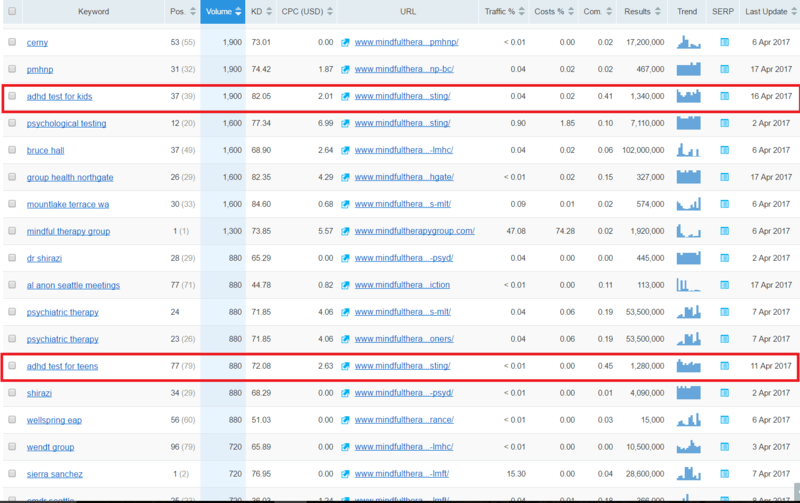 But this also tells us what sites we should be looking at in terms of their content and what we’re up against. We’ll want to review those sites to know what level and quality of content we’ll need to create to continue to beat them out in search rankings. Far more important than what competitors are doing is what customers are actually looking for. 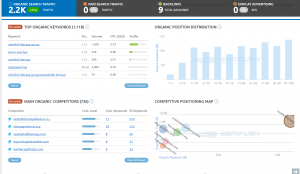 This is where we need to do keyword research. Here is the example from our Seattle centers. We can see again that we’ve nearly doubled their search traffic since we started working with this group in January. 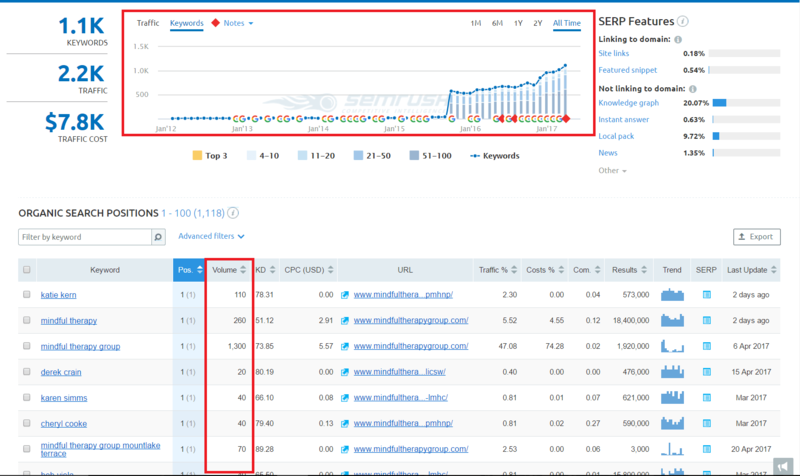 Then, when we look at keywords on the left and the highlighted volume box, this will tell us what people are interested in. As you can see, the current search volume is not very high for keywords listed, so we’ll want to sort by keyword volume to see what people are really looking for. 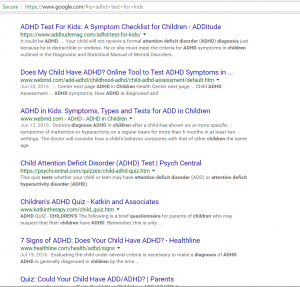 As we can see, two of the highest monthly searches are around ADHD testing for kids and teens. Combined, we see a search volume of 2,780 per month. That’s a lot of potential clients! Already, we’re quite confident that we want to write a major post or add a page to the website just on this topic. However, we can’t just write any old post. This is the big mistake that most organizations and even agencies make. We need to write a post that is better than anything else currently showing up in results. So we want to check the competitor pages we already found. You can do this very quickly right from Google. In the Google search bar, simply type “site:www.sitename.com + ‘words you’re looking for’”. This will give us every page on the competitor site that uses this term. We can now understand if they have some really great content that we’ll have to out-write or if something similar might even do the trick. We also will want to do a general search in Google as well for the same search term and check the top 10 results. If we do a general Google search, we see what we would expect, titans like WebMD, PsychCentral, and Healthline. We know we’re not going to be able to compete with national level sites with tremendous domain authority, so let’s look more local. Here we see who our competitors are. 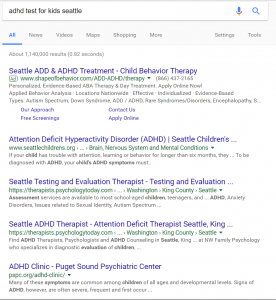 If we open the link to http://www.seattlechildrens.org/medical-conditions/brain-nervous-system-mental-conditions/adhd/, we can see that it’s a very basic page with just the bare bones of information and it’s ranked #1. So we’re very confident that we can write a much better post. By doing so, we put ourselves in an excellent position to get on the first page of Google and take over that #1 spot. Of course, just writing the good content won’t do it. We’ll need to get links to the post and push out through social media as well. These are just a few of the over 500 signals Google will look for to get the page ranking, but it will work. 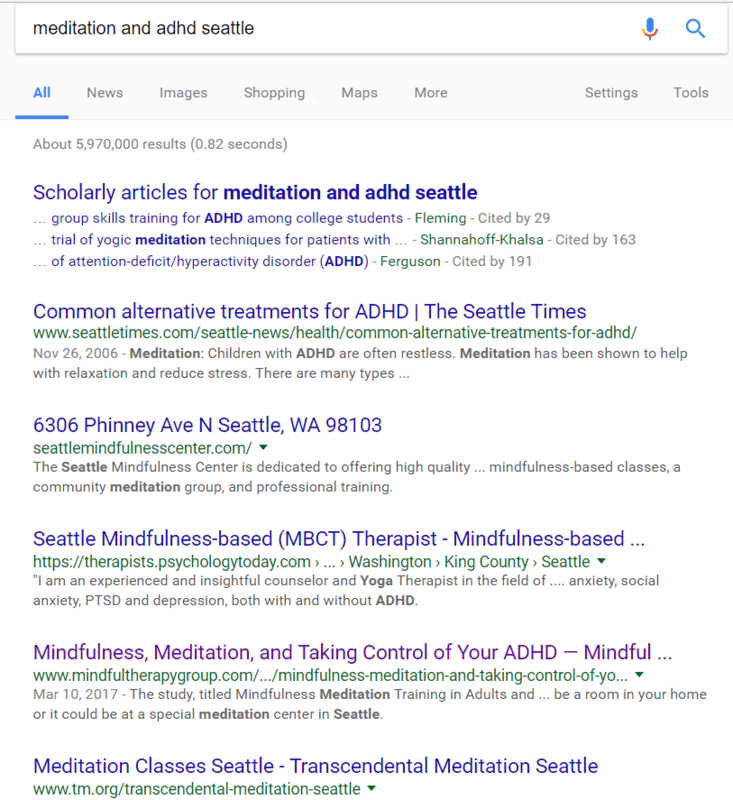 As you can see in our post from March 10th, we wrote one on Meditation & ADHD, two keywords that are highly relevant to our target audience. Written just 2 months ago and it’s already ranking in position 4! Doing an analysis of the past month, April 10th to May 4th, we see that that post alone has brought in 116 visitors with a time on site of 4:24, so clearly a very interested group. That’s 116 potential clients in less than a month on a fairly new post! This will only grow over time. Assuming that just one of those visitors actually ended up calling and signing up with a therapist, that’s another $800 a month in revenue for that particular center. Not bad for a single blog post, right? It can be that easy, but we’d also like to share a couple more tips for determining relevant content to write on. You can also check Twitter to see what conversations are happening in real time and what questions people in the community are asking. Here we see that, with the recent decision in Congress, two hashtags: #IAmAPreexistingCondition and #TrumpCareKills are trending. So this might be a great topic to write a post on as well. As with all trending topics, it will only give us a big traffic boost for a short time, probably a month at most, but may be worth the effort. If this issue wasn’t so prominent, we would also likely see more standard questions that the community is asking. Another great place to go for new questions in the community are places like Quora.com or Reddit.com. The drawback to these sites is that they are not localized. So they may give us an idea of overall trending topics nation-wide, but not necessarily for our area. 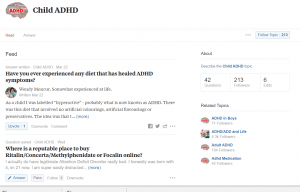 We see above that there are 42 questions on the topic of Child ADHD here on Quora and only 213 people are following the topic. That’s not many. Especially if we look at the lower right and see ADHD/ADD and Life has 4.3K following. When we go back and look at our local search volume (nearly 2.7K per month), it’s clear that the local interest in our area is much stronger than national interest. As you can see, simply writing on relevant topics is not nearly enough to implement a content strategy that actually drives results. In-depth research on what customers are looking for, what’s trending, and what competitors are doing is essential to ensuring you come out ahead. Through these strategies, we’ve delivered revenue generation of $50,000+ per month for clients just off of their content. If you’d like to learn how we can use content and digital marketing to drive revenue for you, just fill out the form below. So we’ve done our research and written a piece of content around a highly relevant topic for our customers as well as ensured it significantly beats out the competitions’ content. Now, to ensure that Google really starts seeing the post, we need to optimize it for SEO. It would be an awful shame to spend all that time and effort writing something that doesn’t get the rankings it deserves just because it hasn’t been optimized. That’s why we use a 17-point checklist to make sure we can get it as high as possible in the Google Rankings. 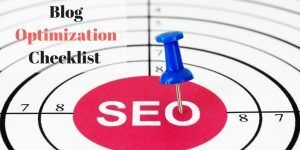 If you’d like to use the same checklist that helps us get page 1 rankings for posts, you can have it for FREE. Just enter your name and email below and you’ll get it immediately in your inbox.